• Ready to use long lasting air freshener. • Notes of peach, jasmine, ylang ylang, amber and musk. • Neutralises unwanted odours such as stale tobacco. 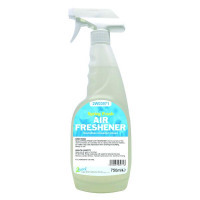 This fragrant ready-to-use air freshener sweeps away stale and stifling odours and leaves a light fresh scent. It eliminates everyday odours instead of simply masking them. The trigger spray mechanism allows for a more controlled spray than an aerosol, provding a more economimcal and environmentally friendly way to freshen rooms.